Social media is one of the most engaging medium of communication today and every blogger wants to display tweets from his/her specific account on the website. This post briefs displaying your latest tweets on your website without knowledge of any programming language. 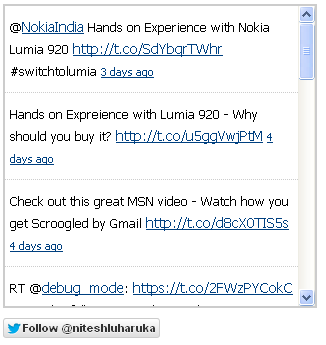 You can just copy and paste the code and start displaying your tweets immediately on your website. You can directly copy and paste the code in WordPress widgets or a plugin or a custom built website or at any position of your website you want it to. Update: Twitter officially deprecated v1.0 API from 11th June 2013. Please use Twitter widgets as explained here. I am writing another blog post for on this update and it will be LIVE soon. In the above code, in line 3 you notice the parameter ‘screen_name=niteshluharuka’. You will need to change this to your desired twitter account username from where you want to display the tweets from. So, if your twitter handle is “mytwitterhandle”, then replace ‘screen_name=niteshluharuka’ with ‘screen_name=mytwitterhandle’ in line 3. If you want to add a Follow button to your twitter account, add the below line after the markup. So, copy & paste and let your visitors see your tweets immediately on your website. Let me know in case you face any issues while implementation.